Natalie is a friendly, fun-loving seven year old girl. Currently in first grade, she enjoys reading (especially with her mommy). However, she does not like being stuck in a reading group at school when it’s not her turn to read. Boring! Some of Natalie’s favorite things to do outside of reading are drawing, playing with friends and siblings, and playing with dolls, especially Barbies. Speaking of which, Barbie books are some of her favorites, but if you hand her a Clifford book, she will most likely respond with a "NO thank you." A perennial favorite book among first graders about a first grader who always seems to be getting into trouble. Natalie loves Junie B. because she is so funny. Ever wonder what it’s like to be a goldfish, Memoirs of a Goldfish gives readers a fun and creative look into the thoughts of one. Natalie loves it because those little guppies are SO cute. It doesn’t hurt that this book is one of her mommy’s favorites too! 3. Elemenopee: The Day L M, N, O, P left the ABC’s by Pamela Hall. After being made fun of for too long by the other letters, L, M, N, O, and P decide to leave. Realizing how much they are needed, the rest of the alphabet has to figure out a way to get them back. Natalie loves this book because it is fun and as an added bonus, it’s a pop-up book! One book Natalie did not like was Clifford goes to Kindergarten by Norman Bridwell. It was just too little kiddish. Let’s call this pick a two for one. 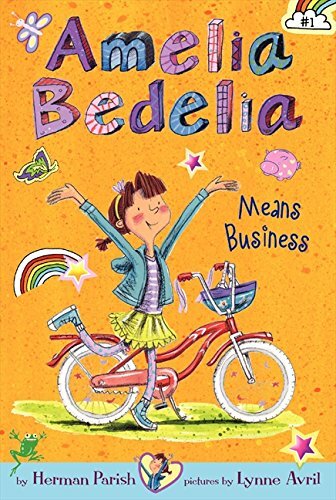 The classic Amelia Bedilia books are hard to resist. The messes this very-literal maid gets herself into are hilarious. I think these are great book for new readers to read on their own or with their parents. More recently, Peggy Parish’s nephew Herman carried on his aunt’s legacy with a series of beginning chapter books featuring a young Amelia Bedilia. Her life is also filled with funny word plays that lead to entertaining misunderstandings. I hope Amelia Bedilia, both the young version and the old, is a character that will make Natalie laugh and that reading them would be a fun experience. Piper Green lives on an island in Maine, she rides a lobster boat to school, and in this first book has a new teacher who doesn’t quite appreciate Piper’s current accessory. This charming first book of the series made me want to read more. I hope Natalie will feel the same. It is a fun read in a unique setting and there just might be a bit of cuteness waiting to be found at the end of the book. One of my personal favorites, I picked The Moffats for Natalie because I think it would be a super-fun book to read with her mommy. Great as a read aloud, easily enjoyable by mom and daughter (and sons as well), The Moffats is a sweet, heartwarming and laugh-out loud story I hope they will love sharing together. Natalie, I hope these books grab your interest and make you laugh. Thanks for answering my questions and letting me pick out books for you.